Benjamin Edward Meara Stiller was born on November 30, 1965 in New York City and raised on the Upper West Side. His father, comedian and actor Jerry Stiller, is from a Jewish family that emigrated from Poland and Galicia in Central Europe. His mother, actress and comedian Anne Meara, who was from an Irish Catholic background, converted to Reform Judaism after marrying his father. While the family was "never very religious", they celebrated both Hanukkah and Christmas, and Stiller had a Bar Mitzvah. His parents frequently took him on the sets of their appearances, including The Mike Douglas Show when he was 6. He considered his childhood unusual, stating: "In some ways, it was a show-business upbringing—a lot of traveling, a lot of late nights—not what you'd call traditional." His elder sister, Amy, has appeared in many of his productions, including Reality Bites, DodgeBall: A True Underdog Story, and Zoolander. Stiller displayed an early interest in filmmaking and made Super 8 movies with his sister and friends. At age 9, Stiller made his acting debut as a guest on his mother's short-lived television series, Kate McShane. In the late 1970s, he performed with the New York City troupe NYC's First All Children's Theater, playing several roles, including the title role in Clever Jack and the Magic Beanstalk. After being inspired by the television show Second City Television while in high school, Stiller realized that he wanted to get involved with sketch comedy. During his high school years, he was also the drummer of the post-punk band Capital Punishment, which released the studio album Roadkill in 1982. The band's bassist, Peter Swann, went on to become (as of 2018[update]) an Arizona Court of Appeals Judge. During its run, Stiller produced a satirical mockumentary whose principal was fellow actor Mahoney. Stiller's comedic work was well received by the cast and crew of the play, and he followed up with a 10-minute short titled The Hustler of Money, a parody of the Martin Scorsese film The Color of Money. The film featured him in a send-up of Tom Cruise's character and Mahoney in the Paul Newman role, only this time as a bowling hustler instead of a pool shark. The short got the attention of Saturday Night Live, which aired it in 1987 and two years later offered Stiller a spot as a writer. Stiller has been described as the "acknowledged leader" of the Frat Pack, a core group of actors who have worked together in multiple films. The group includes Jack Black, Will Ferrell, Vince Vaughn, Owen Wilson, Luke Wilson, and Steve Carell. Stiller has been acknowledged as the leader of the group because of his multiple cameos and for his consistent use of the other members in roles in films which he produces and directs. He has appeared the most with Owen Wilson (in twelve films). Of the 35 primary films that are considered Frat Pack films, Stiller has been involved with 20, in some capacity. Stiller dated several actresses during his early television and film career, including Jeanne Tripplehorn, Calista Flockhart, and Amanda Peet. In May 2000, Stiller married Christine Taylor at an oceanfront ceremony in Kauai, Hawaii. They met while filming a never-broadcast television pilot for the Fox Broadcasting network called Heat Vision and Jack. The couple appeared onscreen together in Zoolander, DodgeBall: A True Underdog Story, Tropic Thunder, Zoolander 2, Curb Your Enthusiasm, and Arrested Development. The couple have two children. In May 2017, Stiller and Taylor announced their separation in a joint statement, after 17 years of marriage. Stiller has mostly appeared in comedy films. He is an Emmy Award winner for his directed, produced and written television show The Ben Stiller Show. ^ "Ellen DeGeneres, Mandy Moore and Ben Stiller Among Stars Mourning Pittsburgh Synagogue Shooting". popculture.com. ^ "Ben Stiller – Actor". Box Office Mojo. Retrieved August 10, 2013. ^ Friend, Tad (June 25, 2012). "Funny Is Money: Ben Stiller and the dilemma of modern stardom". The New Yorker. Retrieved March 26, 2015. ^ "Edward J. Meara, Former Resident, Dies In Boston" (PDF). Rockville Centre NY Long Island News and Owl. December 23, 1966. Retrieved March 26, 2015. ^ "Ben Stiller Biography: Film Actor". Biography.com (FYI/A&E Television Networks. Archived from the original on October 2, 2013. Retrieved March 26, 2015. ^ "West Side Rag » WHY JERRY STILLER LIVES ON THE UPPER WEST SIDE". West Side Rag. Retrieved March 5, 2019. ^ Married to Laughter: A Love Story Featuring Anne Meara - Jerry Stiller. Google Books. Retrieved June 25, 2013. ^ a b Wood, Gaby (March 14, 2004). "The geek who stole Hollywood". The Guardian. Retrieved March 29, 2009. ^ "NEW AGAIN: BEN STILLER". Interview Magazine. March 11, 2015. Retrieved April 18, 2018. ^ "Ben Stiller relieved he is not single". Evening Standard. December 23, 2013. Retrieved April 18, 2018. ^ Wallace, Debra (November 19, 1999). "Stiller 'softy' in real life". Jewish News of Greater Phoenix. Retrieved March 29, 2009. ^ Dutka, Elaine (March 1, 1998). "Finding an Afterlife as a Playwright". Los Angeles Times. Retrieved August 10, 2013. ^ O'Toole, Lesley (December 22, 2006). "Ben Stiller:'Doing comedy is scary'". The Independent. London, UK. Retrieved August 10, 2013. ^ Mundy, Chris (November 12, 1998). "The Evolution of Ben Stiller". Rolling Stone. Retrieved January 17, 2019. ^ Dow, Steve (April 27, 2014). "What I know about women". The Sydney Morning Herald. Retrieved January 17, 2019. ^ "Ben Stiller Measures Up". TV Guide. April 18, 2000. Retrieved April 18, 2018. ^ Longsdorf, Amy (December 3, 2010). "Christine Taylor: Sweet for the holidays". The Morning Call. Retrieved December 5, 2010. ^ a b Stated on Inside the Actors Studio, 2001. ^ McIntee, Michael Z. "Monday, May 30, 2005, Show #2366 recap". Late Show with David Letterman. Archived from the original on May 14, 2007. Retrieved March 29, 2009. ^ a b Masello, Robert (November 28, 2006). "What makes Ben Stiller funny?". Parade. Archived from the original on June 3, 2009. Retrieved March 29, 2009. ^ Mitchell, Elvis (September 28, 2001). "A Lost Boy in a Plot to Keep The Fashion Industry Afloat". The New York Times. Retrieved January 9, 2010. ^ a b McCarthy, Ellen (December 22, 2006). "Ben Stiller Isn't Funny. Or So He Says..." (Fee required). The Washington Post. Retrieved March 29, 2009. ^ Gordon, Jeremy and Amy Phillips (March 27, 2015). "Ben Stiller's Teenage Punk Band, Capital Punishment, Reissued by Captured Tracks". Pitchfork. Retrieved December 12, 2015. ^ Postigo, Cheyenne (March 27, 2015). "Captured Tracks to reissue album by Ben Stiller's teenage 'no wave/retardo' punk band – listen". NME. Retrieved December 12, 2015. ^ a b c d e f Wills, Dominic. "Ben Stiller Biography". Tiscali. Archived from the original on February 17, 2009. Retrieved March 29, 2009. ^ "Something Something Japanese". Conan. Season 2. Episode 121. July 26, 2012. TBS. ^ a b Svetkey, Benjamin (October 16, 1992). "Our Son the Comedian". Entertainment Weekly. Archived from the original on January 13, 2010. Retrieved January 9, 2010. ^ a b Wickstrom, Andy (January 5, 1990). "The King Lives in 'Elvis Stories'". Boca Raton News. Retrieved January 9, 2010. ^ a b Wills, Dominic. "Ben Stiller – Biography". Tiscali. Retrieved January 9, 2010. ^ a b Bianculli, David (August 24, 1995). "'Stiller' Gonna Make Sat. Night Livelier". New York Daily News. Retrieved August 10, 2013. ^ Kushner, David (March 26, 1999). "Jokers Mild". Entertainment Weekly. Retrieved January 11, 2010. ^ Wolk, Josh (December 5, 2003). "Stiller Standing". Entertainment Weekly. Archived from the original on April 25, 2009. Retrieved March 29, 2009. ^ a b Read, Kimberly; Purse, Marsia (August 4, 2007). "Ben Stiller – Actor/Comedian". About.com. Archived from the original on February 14, 2009. Retrieved March 29, 2009. ^ "Ben Stiller Finds 'Reality' is in the Genes". New Straits Times. February 15, 1994. Retrieved January 9, 2010. ^ "Reality Bites Weekend Box Office". Box Office Mojo. Retrieved January 11, 2010. ^ "Reality Bites (1993)". Rotten Tomatoes. Archived from the original on February 13, 2010. Retrieved January 11, 2010. ^ Holden, Stephen (February 17, 1995). "Spoofing the TV Gurus of Fitness". The New York Times. Retrieved January 9, 2010. ^ Lowry, Brian (February 19, 1996). "Happy Gilmore". Variety. Retrieved January 9, 2010. ^ Waxman, Sharon (July 23, 1996). "Stiller Standing" (Fee required). The Washington Post. Retrieved March 29, 2009. ^ Lawrence, Will (September 28, 2007). "Ben Stiller behaving badly". London, UK: guardian.co.uk. Retrieved January 11, 2010. ^ Turan, Kenneth (October 6, 2000). "Meet the Parents". Los Angeles Times. Archived from the original on October 27, 2007. Retrieved January 11, 2010. ^ "Meet the Parents". Rotten Tomatoes. Archived from the original on January 6, 2010. Retrieved January 13, 2010. ^ "Meet the Parents". Box Office Mojo. Archived from the original on January 30, 2010. Retrieved January 13, 2010. ^ Mills, Nancy (October 3, 2007). "Bride of Ben". The Record. Retrieved January 11, 2010. ^ "Zoolander faces Malaysian censorship controversy". London, UK: guardian.co.uk. March 5, 2002. Retrieved March 29, 2009. ^ Maher, Kevin (June 30, 2002). "Back with a bang". The Observer. London. Retrieved March 29, 2009. ^ Bradshaw, Peter (March 15, 2002). "The Royal Tenenbaums". London, UK: guardian.co.uk. Retrieved January 13, 2010. ^ Macaulay, Sean (January 20, 2004). "Ben there, done that". The Times. London. Retrieved January 13, 2010. ^ Patterson, John (January 14, 2002). "Strange Fruit". London, UK: guardian.co.uk. Retrieved January 13, 2010. ^ Watts, Duncan J. "Nobody Knows Anything (2003)". The New York Times. Retrieved January 13, 2010. ^ Breznican, Anthony (December 12, 2006). "'Museum' Exhibits Funny Pals; Ben Stiller's Key to Success: One For All, All For One" (Fee required). USA Today. Retrieved January 13, 2010. ^ Clark, Tim (July 31, 2000). "PPV's Cure for the Summertime Blues". Cable World. Retrieved March 29, 2009. ^ "Envy". Box Office Mojo. Retrieved March 29, 2009. ^ "Meet the Fockers". Box Office Mojo. Archived from the original on March 31, 2009. Retrieved March 29, 2009. ^ "Night at the Museum – Daily Box Office". Box Office Mojo. Retrieved March 29, 2009. ^ "The Heartbreak Kid". Box Office Mojo. Retrieved January 11, 2010. ^ "The Heartbreak Kid". Rotten Tomatoes. Archived from the original on February 13, 2010. Retrieved January 11, 2010. ^ Vary, Adam B. (March 3, 2008). "First Look: 'Tropic Thunder'". Entertainment Weekly. Archived from the original on November 7, 2010. ^ Siegel, Tatiana (June 2, 2008). "Ed Helms mans 'Manure'". Variety. Retrieved March 29, 2009. ^ "DreamWorks Animation Acquires Superhero Spoof". VFX World. April 3, 2007. Retrieved March 29, 2009. ^ Kit, Borys (October 13, 2010). "Eddie Murphy to Star in "Tower Heist"". ABC News. Retrieved January 6, 2010. ^ Barnes, Henry (July 20, 2011). "Ben Stiller to direct and star in The Secret Life of Walter Mitty". The Guardian. Retrieved July 16, 2015. ^ a b c "Learn More". Frat Pack Tribute. Archived from the original on July 28, 2010. Retrieved July 13, 2010. ^ Wloszczyna, Susan (July 13, 2006). "'Frat Pack' splits". USA Today. Retrieved January 9, 2010. ^ Wloszczyna, Susan (June 17, 2004). "These guys would be great to hang out with". USA Today. Retrieved January 9, 2010. ^ "Stiller tired of "Frat Pack" label". Ben Stiller dot Net. September 23, 2006. Retrieved February 14, 2010. ^ "Ben Stiller". Yahoo!. Retrieved March 29, 2009. ^ "Ben Stiller's funny charms". Monsters and Critics. December 16, 2006. Archived from the original on January 11, 2009. Retrieved March 29, 2009. ^ Errico, Marcus (May 16, 2000). "Ben Stiller Hitched!". E!. Retrieved October 9, 2013. ^ Tulloch, Lee (November 16, 2013). "Ben Stiller in the moment". The Sydney Morning Herald. ^ Jayme, Deerwester. "Ben Stiller, Christine Taylor separate after 17 years of marriage". USA Today. Gannett. Retrieved April 1, 2018. ^ Brandon, Voss. "Edie Falco & Ben Stiller Play House". Playbill. Philip S. Birsh. Retrieved April 1, 2018. ^ "Ben Stiller's Federal Campaign Contribution Report". Newsmeat. Archived from the original on October 17, 2008. Retrieved March 29, 2009. ^ Kaufman, Gil (July 17, 2007). "Will Smith, Ben Stiller, Even Paulie Walnuts Open Wallets for Presidential Candidates". MTV. Retrieved March 29, 2009. ^ "Ben Stiller Charity Information". Look to the Stars. Archived from the original on March 20, 2009. Retrieved March 29, 2009. ^ "The religion and political views of Ben Stiller". hollowverse.com. Retrieved October 20, 2014. ^ "Hollywood and 'The Cove' Join Forces for Dolphin Awareness: Ben Stiller, Jennifer Aniston and friends appear in The Cove PSA: My Friend is...". mashable.com. April 22, 2010. ^ "'Five Year Mission' Enters 31st Season". The Daily Courier. Google News. Associated Press. October 7, 1996. Retrieved January 13, 2010. ^ "Holy Shat! Insults Fly at Comedy Central Roast". Startrek.com. August 15, 2006. Retrieved January 13, 2010. ^ Silverstein, Adam (April 19, 2009). "Stiller: 'J.J. Abrams did great job'". Digital Spy. Retrieved January 13, 2010. ^ Shoard, Catherine (October 4, 2016). "Ben Stiller speaks about diagnosis with prostate cancer". The Guardian. Retrieved January 26, 2018. ^ Hautman, Nicholas (October 4, 2016). "Ben Stiller Reveals He Was Diagnosed With Prostate Cancer". Us Weekly. Retrieved October 4, 2016. ^ "Hollywood actor Ben Stiller reveals he had prostate cancer but is now cancer-free". BBC News. October 4, 2016. Retrieved October 4, 2016. ^ "Ben Stiller". Television Academy. Archived from the original on August 2, 2016. Retrieved February 3, 2019. ^ "Awards for Ben Stiller". Internet Movie Database. Retrieved March 29, 2009. ^ "Ben Stiller to receive MTV honour". BBC. May 23, 2009. Retrieved March 25, 2010. ^ Senn, Tom (April 19, 2005). "Comedian Stiller performs at Class of 2005 event". The Daily Princetonian. Archived from the original on September 28, 2008. Retrieved March 29, 2009. ^ "Ben Stiller, Scarlett Johansson to receive Hasty Pudding awards at Harvard". International Herald Tribune. Associated Press. January 29, 2007. Archived from the original on September 3, 2007. Retrieved March 29, 2009. ^ Rogers, John (April 1, 2007). "Ben Stiller wins top Kids Choice prize – the Wannabe". The Eagle. Archived from the original on October 12, 2007. Retrieved March 29, 2009. ^ Dave McNary (August 23, 2011). "BAFTA/L.A. award to Ben Stiller". Variety. Reed Elsevier Inc. Retrieved July 31, 2012. ^ "Zoolander 2 premiere: Ben Stiller snaps up Guinness World Records title for longest selfie stick". February 5, 2016. Bankston, John (2002). Ben Stiller: Real-Life Reader Biography. Mitchell Lane Publishers. ISBN 1-58415-132-3. Dougherty, Terri (2006). Ben Stiller: People in the News. Lucent Books. ISBN 1-59018-723-7. 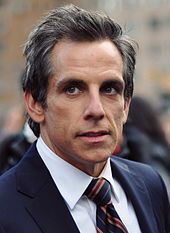 Wikimedia Commons has media related to Ben Stiller.